These are great little boxes that will turn any desktop hard drive into a external storage device, works with both IDE and SATA drives. these are really handy for anyone who fixes computers as they give you one box that reads any drive meaning less for engineers to carry with them. 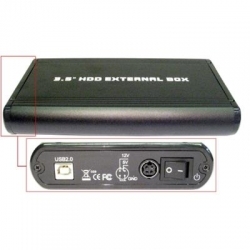 The CDLSB-807 is a 3.5" enclosure for connecting an IDE or SATA HDD via USB type B. Comes with a type A to type B cable.